According to the U.S. Department of Education, three-quarters of the fastest-growing occupations require more than a high school diploma. At eVersity, we believe everyone should have the opportunity to pursue a college degree without cost being a hurdle. That’s why our approach is simple. Your eVersity tuition price — one of the lowest in the U.S. — is the full price. There are no additional fees. And you pay as you go, so you don’t have to worry about a large, upfront cost. As a not-for-profit institution, we work hard to keep our operating costs low so we can keep your tuition low. Where we invest our resources is in your education. Our faculty has a wealth of experience specializing in our areas of study, and are deeply committed to your success. There are no asterisks with our costs. 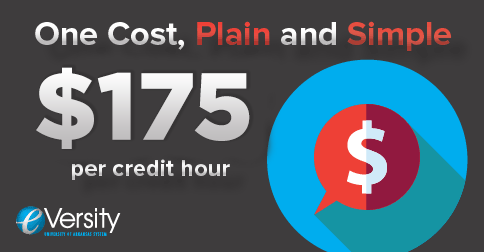 You pay one fee per credit hour and we take care of the rest. Where we can, we rely on free educational material instead of expensive textbooks. If a course requires a textbook, we pay for it at no additional expense to you. We understand that money is tight. That’s why eVersity advisors work hard to maximize your transfer credits and prior learning experience, to help lower costs. We’ll also help with tuition planning to fit your overall budget, finding ways for you to save money and borrow responsibly, if needed. As long as you remain continuously enrolled at eVersity, making progress toward your degree, your cost per credit hour never goes up — even if tuition rates increase. Payment for each course is due at the start of the class. Students may cancel a class and receive a 100% refund up to the end of day 4 of the course. Obtaining a college degree is one of the most important investments you can make in yourself. If you’re not sure that the benefits outweigh the costs, consider this: studies have shown that people who obtain a college degree earn approximately $1 million more in their lifetime than those with only a high school diploma. College graduates also have a lower unemployment rate — 2.8% compared to the nation’s overall rate of 5.7%. From affordable tuition to career-ready degrees, eVersity has been designed for your success. Get started towards the future you deserve.